Southern Illinois University Press, 9780809329892, 248pp. 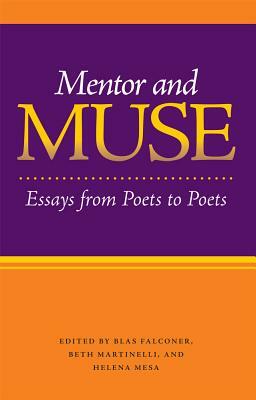 In Mentor and Muse, a collection of twenty-nine insightful essays by some of today’s leading poetic minds, editors Blas Falconer, Beth Martinelli, and Helena Mesa have brought together an illuminating anthology that draws upon both established and emerging poets to create a one-of-a-kind resource and unlock the secrets of writing and revising poetry. Gathered here are numerous experts eager to share their wisdom with other writers. Each author examines in detail a particular poetic element, shedding new light on the endless possibilities of poetic forms. Addressed within are such topics as the fluid possibilities of imagery in poetry; the duality of myth and the personal, and the power of one to unlock the other; the surprising versatility of traditional poetic forms; and the pleasure of collaboration with other poets. Also explored in depth are the formative roles of cultural identity and expectations, and their effect on composition; advice on how to develop one’s personal poetic style and approach; the importance of setting in reading and meaning; and the value of indirection in the lyric poem. Challenges to conventional concepts of beauty are examined through Shakespeare’s sonnets, and the ghost of Longfellow is called upon to guide students through the rewards and roadblocks of writing popular poetry. Poetic persona is demystified through Newton’s law of gravity, while the countless permutations of punctuation are revealed with analysis of e. e. cummings and W. S. Merwin. The essays include the full text of the poems discussed, and detailed, relevant writing exercises that allow students the opportunity to directly implement the strategies they have learned. While many advanced topics such as authenticity, discordant music, and prosody are covered, this highly readable volume is as user-friendly as it is informative. Offering a variety of aesthetics and approaches to tackling the issues of composition, Mentor and Muse takes poets beyond the simple stages of poetic terms and strategies. These authorsinvite students to explore more advanced concepts, enabling them to draw on the traditions of the past while at the same time forging their own creative paths into the future. Blas Falconer teaches poetry and memoir at Austin Peay State University. He is the author of A Question of Gravity and Light. Beth Martinelli's poems appear in numerous literary magazines, including The Threepenny Review, Bellingham Review, and Pleaides. Her chapbook, To Darkness, was published in 2007. Helena Mesa is an assistant professor of English at Albion College. She has written poems for several literary journals, including Indiana Review and Barrow Street.